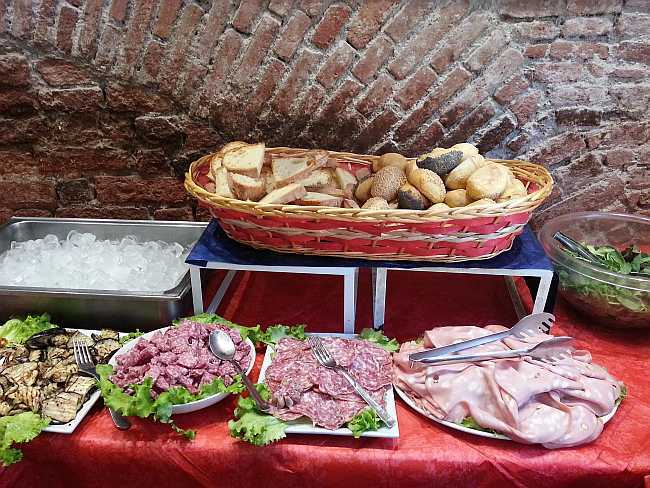 A small section of the apertivo buffet at a place in Milan, in the Navigli district. 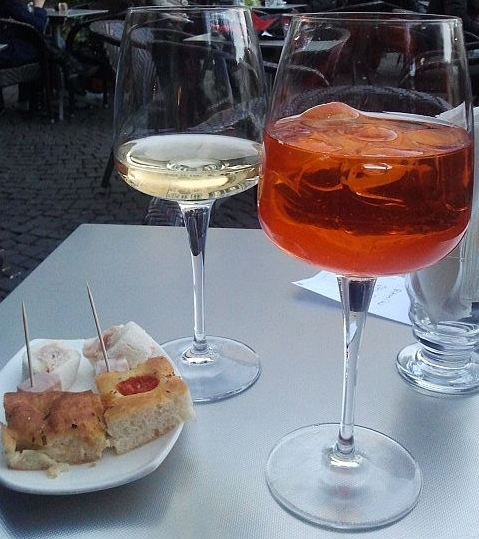 Aperitivo in Italy is a thing. The word aperitivo means a pre-dinner drink, which Italians have been doing for years, but in the past decade or so the term has broadened to mean a drink that comes with a pretty extensive buffet of food. 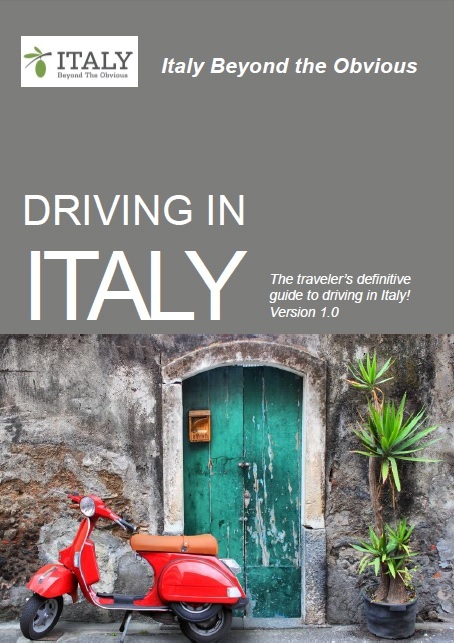 The tradition started in northern Italy, in Milan and Turin and Parma, but it has since spread across Italy: up to mountain towns in the Dolomites, down to Rome and Naples, and everywhere in between. The traditional aperitivo is the Aperol Spritz, which is made with Aperol, prosecco, soda water, and a slice of orange. But you can order other drinks, a glass of wine, or even a non-alcoholic beverage. Drinks are marked up to compensate for the price of the food, so if you only want a drink and no food, find somewhere that is not serving food. It’s not intended to be a substitute for dinner, although the food is included when you order a drink. Although the buffet is extensive, the plates are small, and Italians take one small plate of food and nibble while socializing with friends. Italy is not an all-you-can-eat culture, and this is a pre-dinner snack. Italians will meet for an apertivo and then head out to dinner. And although you’re not supposed to go back for seconds and thirds, nobody will stop you. If you do plan to just nibble along with the Milanesi or Torinesi, you’ll still have a great local experience, soaking up the buzz of Italians just coming off work who are still dressed to the nines and relaxing with friends. In Milan, head to the Navigli or canals area of the city, and you’ll have your pick of great aperitivo options. In Turin, go to the Quadrilatero D’Oro area. In Rome, the city center has lots of options. Good suggestions here. In Florence, take these recommendations. In Venice – where the spritz was born – it’s traditional to have a spritz with Venetian small plates or cicchetti (which are not included in the price of the drink). Great information on Spritz in Venice here. 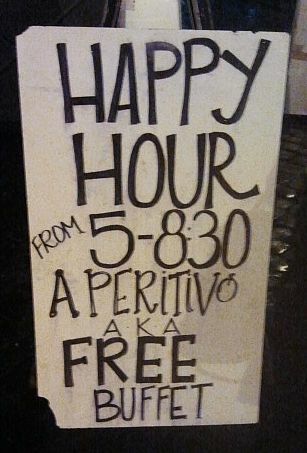 One more thing: avoid places that advertise aperitivo like this.